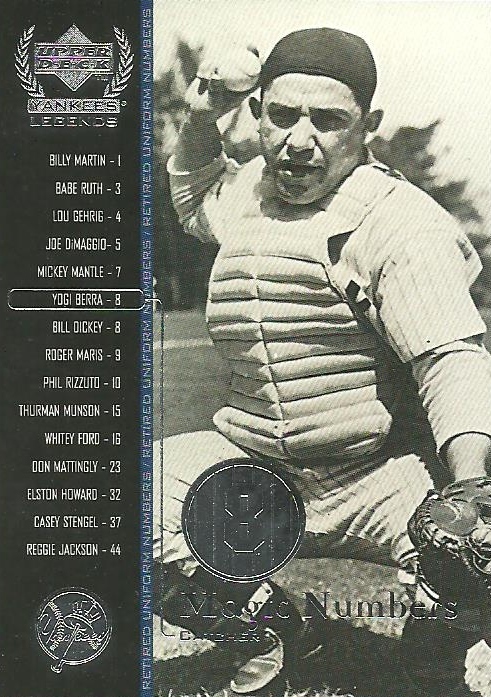 I have a Hall of Fame binder where I have one card for every person in the National Baseball Hall of Fame. I should say I have a card, or a space for a card, for every person in the National Baseball Hall of Fame. 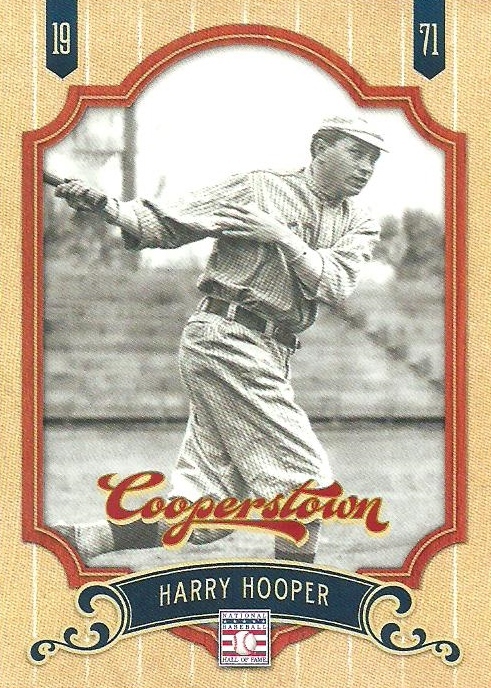 I picked up this 2012 Panini Cooperstown card of Harry Hooper at my LCS from one of the 15/$1 boxes. This fills a hole in my binder. Let's take a look at the life and career of Harry Bartholomew Hooper. Hooper was born on August 24, 1887 in Bell Station, California and died on December 18, 1974 at the age of 87 in Santa Cruz, California. Harry Hooper played for the Boston Red Sox from 1909 - 1920 and for the Chicago White Sox from 1921 - 1925. Hopper was on four World Series winners; all with the Red Sox in 1912, 1915, 1916, and 1918. 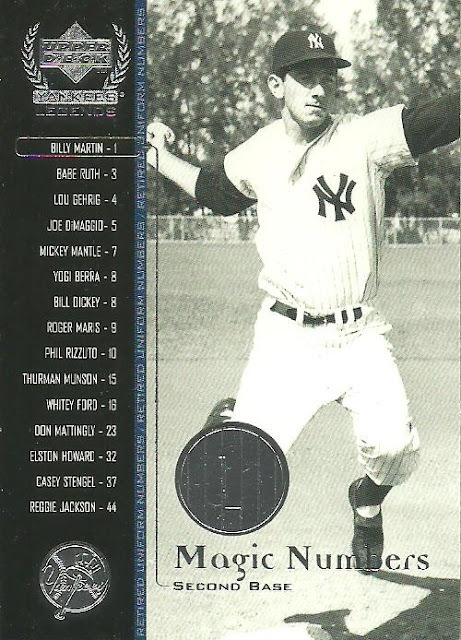 Hooper played outfield alongside Tris Speaker and was a major influence in having Babe Ruth switch from a pitcher to an outfielder. He hit .281 with 2,466 hits during his career and is still the Red Sox all-time leader in triples (131) and stolen bases (300) and was inducted into the National Baseball Hall of Fame in 1971. 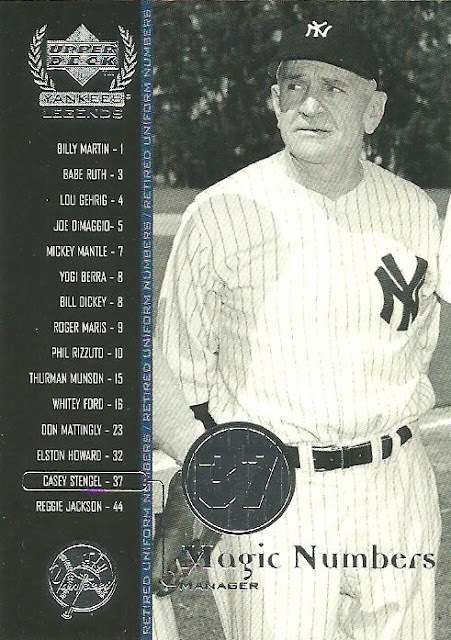 After retiring from baseball, Hooper lived in Capitola, California and Hooper Beach there is named after him. Ever had a card rust before? I picked up a small lot of 1996 Leaf Preferred Steel cards from my LCS this past Saturday from the 15/$1 boxes. 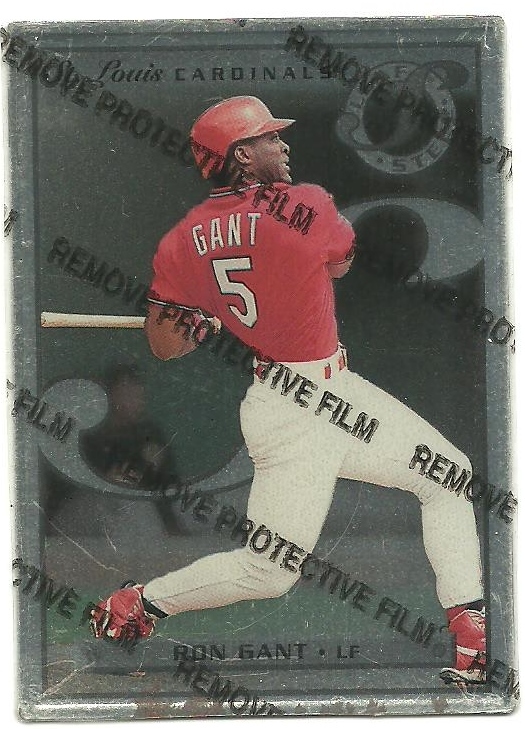 I don't ever remember seeing rust on a card before but you can see what appears to be rust on the bottom of this Ron Gant card. 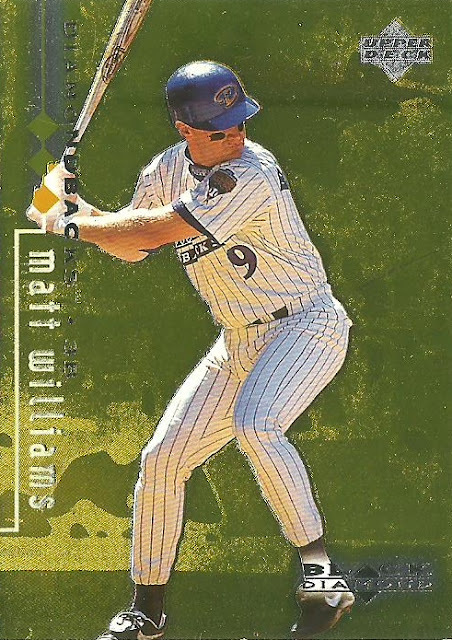 These cards were inserted 1 per pack and contain a protective film. Obviously the "protective film" does not protect the card from rust. For those who wonder if the film is supposed to be removed, it tells you. So I did. Here;s what it looks like. Whenever I go to the LCS I always take a look through their 15/$1 boxes to see if there is something new. 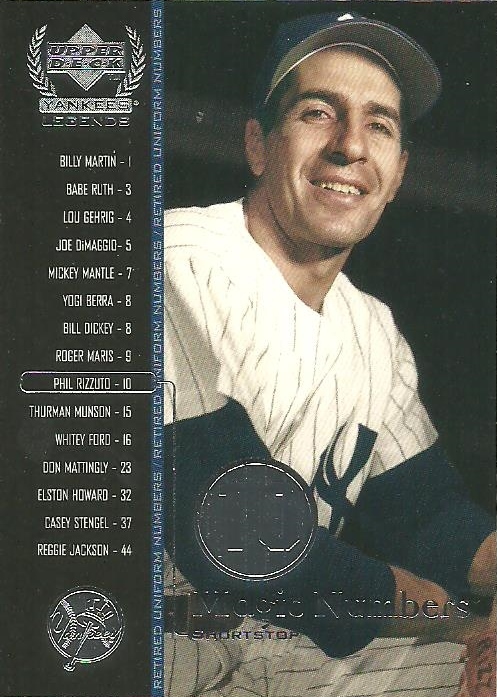 This past Saturday I came across a stack of cards from the 2000 Upper Deck Yankees legends set that peaked my interest. I don't remember ever seeing these before, so that made them even better. 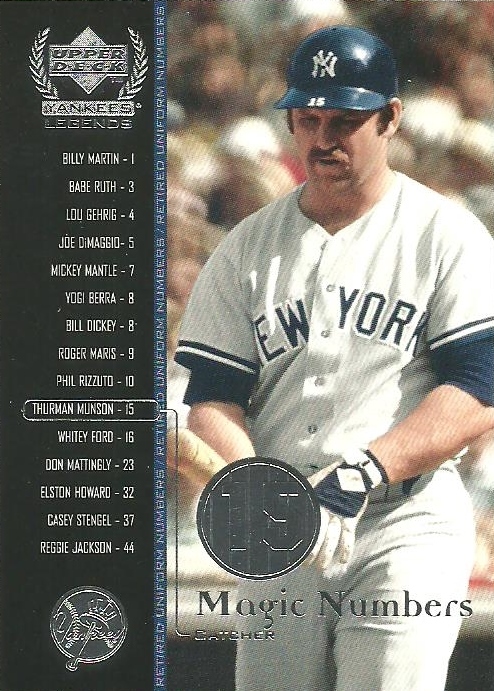 These Magic Numbers were all the numbers that had been retired by the Yankees at the time of this set.The Yankees have retired 6 additional numbers since 2000 (Torre, Posada, Rivera, Petitte, Guidry, and Williams). Most of the big names (Ruth, Gehrig, DiMaggio, Mantle) are missing, but that's okay. Let me know if you have any I need and we can see if we can work out a trade. 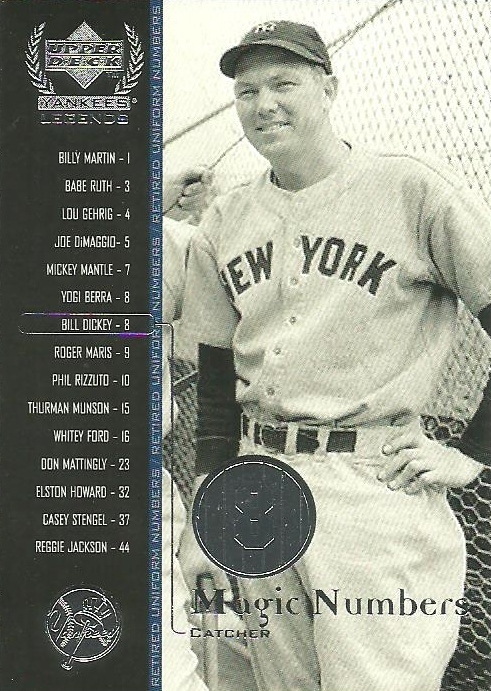 I need Babe Ruth, Lou Gehrig, Joe DiMaggio, Mickey Mantle, Roger Maris, Whitey Ford, Don Mattingly, and Reggie Jackson. Since I recently organized my Ken Griffey Jr. collection I decided that I would conquer my Mike Piazza collection next. 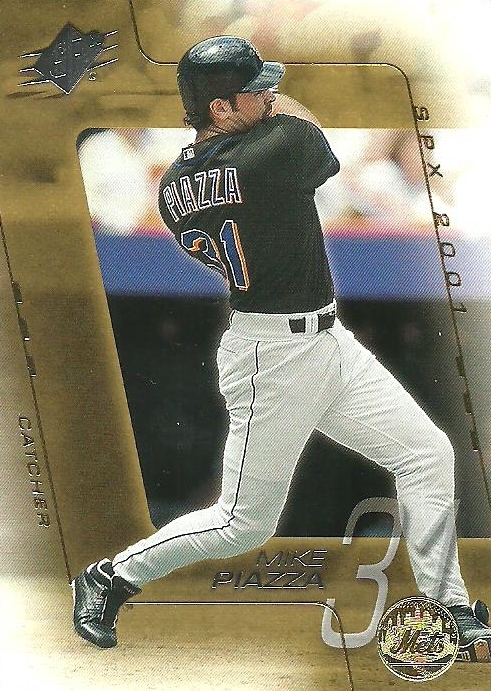 While I've organized and counted both my Griffey and Piazza collections, I haven't actually put together a list of cards in either collection. This will take some time. As of the writing of this post I have 574 different Mike Piazza cards, with another 23 Piazza cards to sort through. For my Griffey collection I have 915 different cards with a stack of 56 cards to go through. 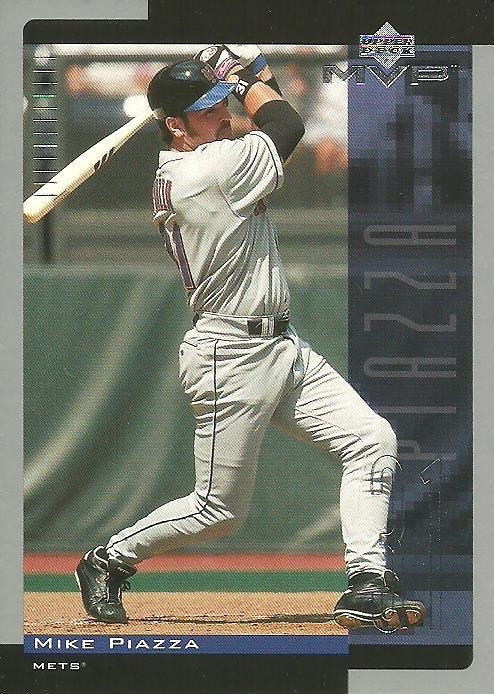 I picked up four Mike Piazza cards this past Saturday from the 15/$1 boxes at my LCS. I actually needed three of them. I picked up four packs of 2017 Topps Update yesterday at my LCS. Update is typically one of my favorite issues. This was my first in person look at the 2017 offering. Take a look at what I pulled. First up, is one of the 600+ Short Prints in the set. 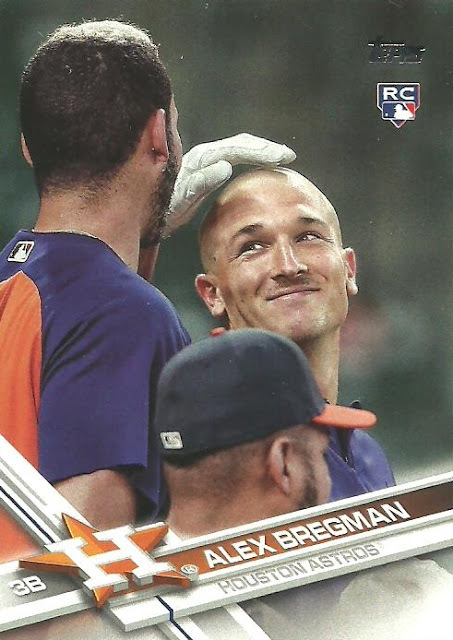 It features Houston Astros infielder Alex Bregman who is headed to the World Series. 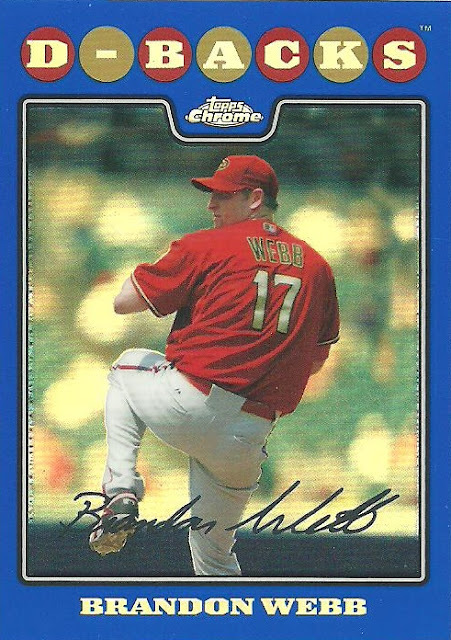 I'll be routing for the Astros in the Fall Classic, but this SP is up for grabs. 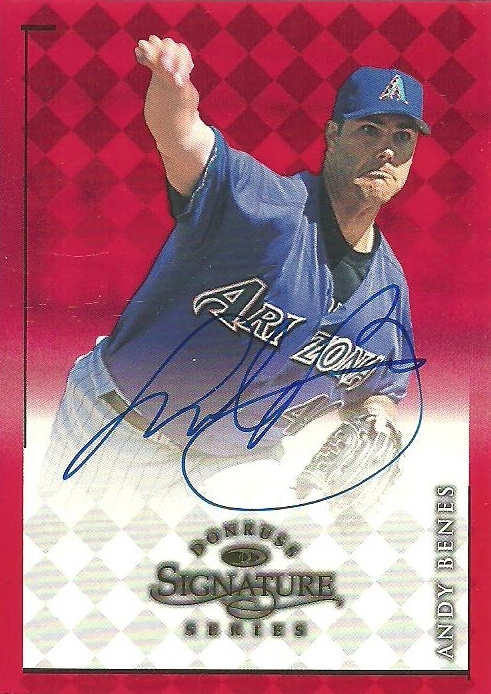 I'd love to trade for the Paul Goldschmidt SP if possible. 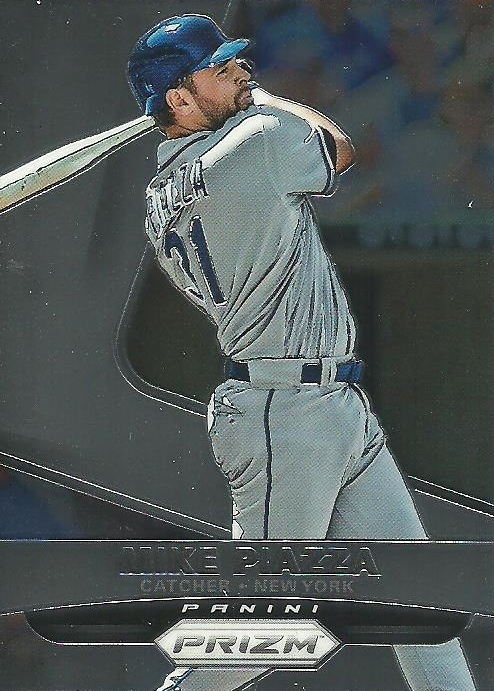 Eventually I'll be completing the set, so these base cards aren't for trade but this is my favorite base card I pulled. 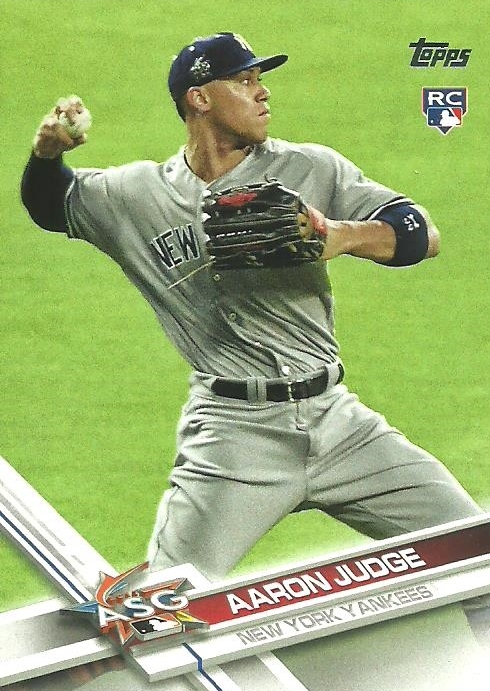 Like I said, I purchased four packs and I pulled two Aaron Judge cards. 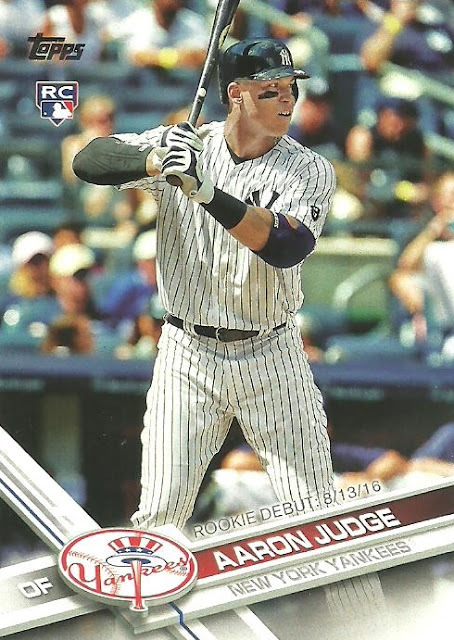 Why does Aaron judge get a Rookie Debut card in 2017 Update when his debut was 8/13/16? 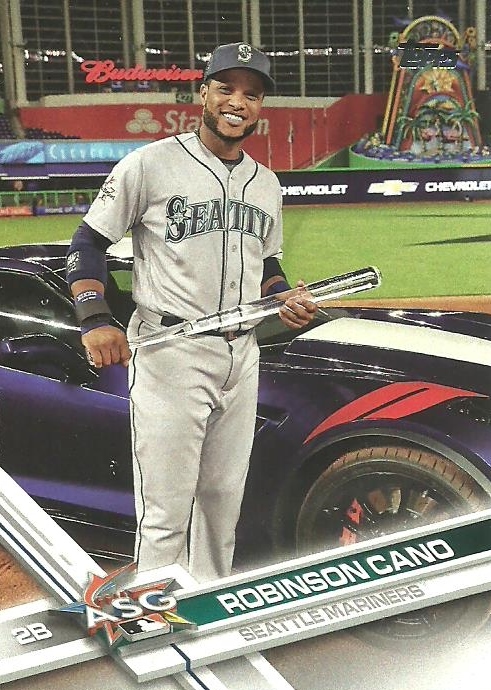 Why does an All-Star card have a RC logo? What do you think about this years Update set? 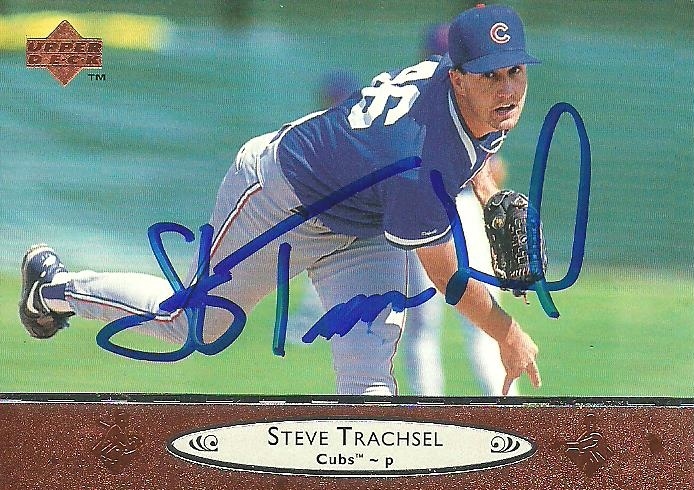 Back in September I sent out a ttm request to former MLB pitcher Steve Trachsel as part of my look at the cover of the November 1998 Beckett Baseball Card Monthly magazine. 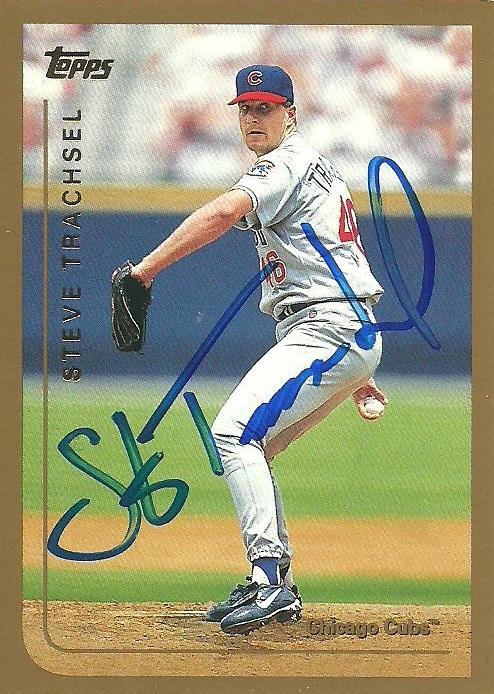 Trachsel gave up home run #62 to Mark McGwire. Tracchsel pitched in the big leagues from 1993 - 2008 and was an All-Star in 1996. 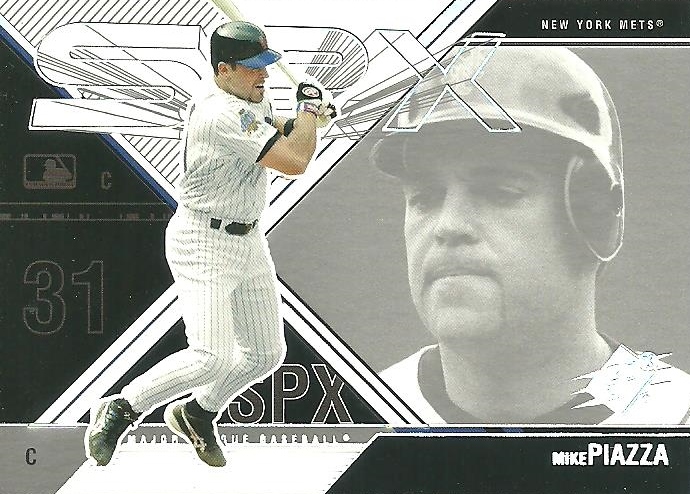 He spent most of his career with the Cubs (1993 - 1999, and 2007) and the Mets (2001 - 2006), but also spent time with the Devil Rays, Blue Jays and Orioles. 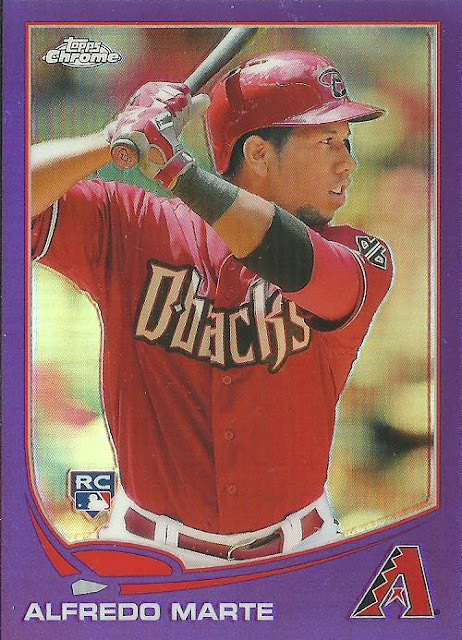 On Wednesday the Diamondbacks beat the Rockies in the N.L. Wild Card game and advanced to the NLDS against the Dodgers. Game #1 was last night. 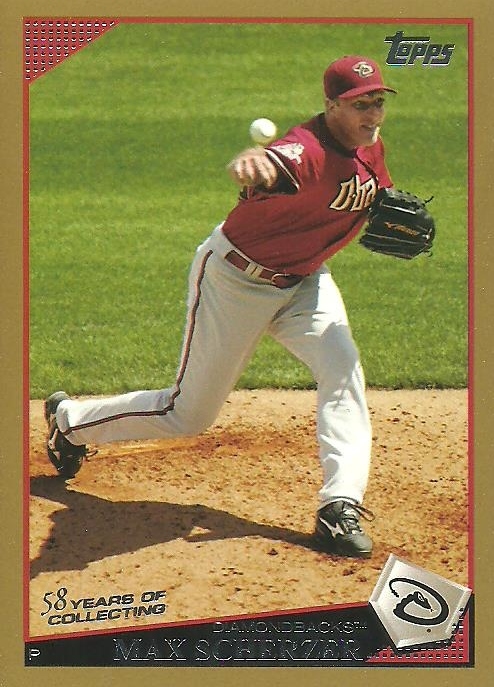 I won't go into much detail, but game #2 is tonight and Robbie Ray will be starting for the D-Backs. 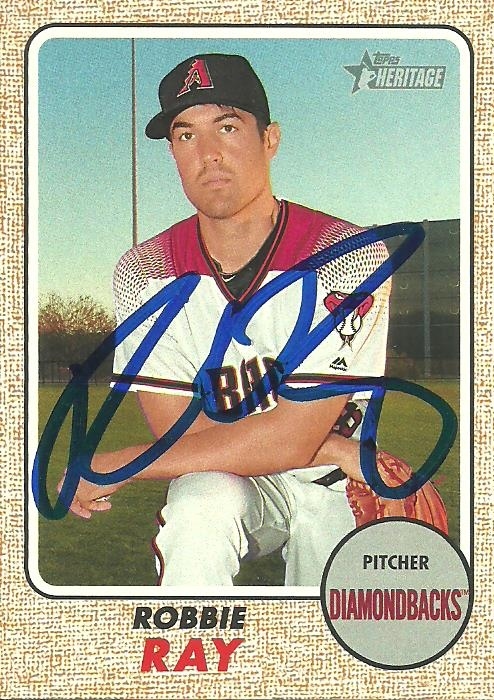 A couple months ago I went to an autograph signing at a Sprint store and had Robbie sign this 2017 Topps Heritage card for me. Ray matched his 2016 strikeout total in 2017 while pitching in 4 less games due to a stint on the DL after he was hit in the face by a come backer. Let's hope he can strikeout a bunch of Dodgers tonight! Last month I was at work thinking about my collection and decided there were some things I needed to do before making more purchases. 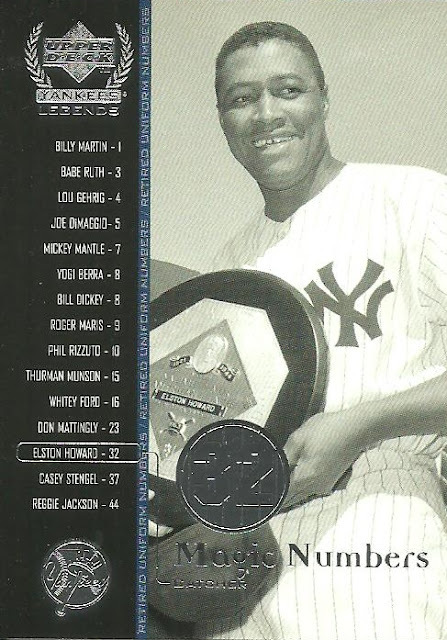 On the list were my usual, organize my Ken Griffey Jr. and Mike Piazza collections. I say "my usual" because every since I started setting card collecting goals on my blog back in 2010, this has been on my list. Well I got home from work and in the mailbox was an unexpected package from Dennis of the blog Too Many Verlanders. He sent me the Great Griffey Giving Box which was started by the Junior Junkie himself. Getting the box was a dream come true and it forced me to sort and organize my collection. I was able to add 116 Griffey cards to my collection thanks to the Great Griffey Giving Box and I added almost 200 of my doubles and shipped it off to another Griffey collector earlier this week. 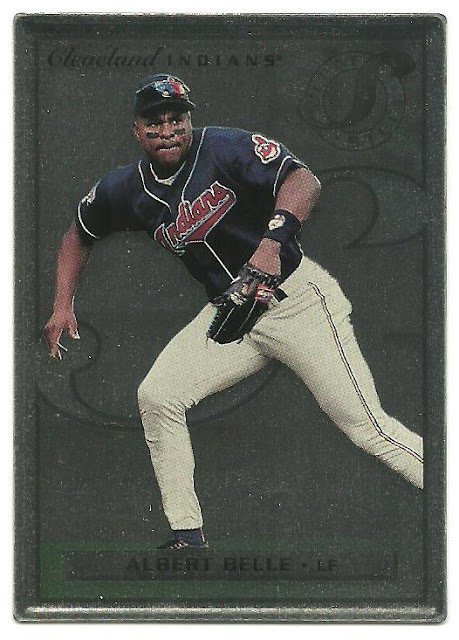 It was hard for me to believe how many basic cards I needed, but the thing is that Griffey just has so many cards out there. In any given set, Griffey could have between 1 -7 different cards and that doesn't even include inserts and parallels. Now I'm working on a checklist. Take a look at what I was able to add to my collection through the Great Griffey Giving Box. Special thank you to Gavin for all the awesome customs. Dennis also sent me some sweet D-Backs magazines (Beckett, SI, etc.) and some D-Backs cards. Thank you Dennis!